We use a combination of M&S, third- party and self audits to assess supplier performance which are logged on a shared database known as SEDEX. Results are reported in detail to the ETI and summarised in our annual How We Do Business Report. We do not currently have any jobs based in the United States. 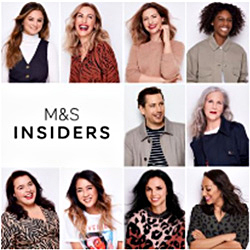 If you would like to work with M&S in the UK or any other countries where we currently operate stores, please refer to careers.marksandspencer.com. You can call us on 97 0429 5507; we’re open from 7am to 8pm (UK time). (or on 0333 014 8430 from UK). We accept major credit/debit cards (Visa, Mastercard, American Express, JCB), Paypal and Apple Pay on iOS devices. We will not charge you foreign transaction fees on payments made via US cards. We currently do not accept payment by gift cards on this website. We will look to offer this in the future. Please note that any giftcards issued for our UK website, marksandspencer.com, will not apply on this website. Simply visit our returns portal to generate your returns label and note, valid for 1 parcel only. You will need your order ID and the email address associated with your M&S US account. o	Send your package at a discounted rate to our local hub and we’ll pay for the rest of the return to UK. o	Visit our returns portal and select this method to see the cost of your return. The cost will be deducted from your refund. o	Drop your parcel at any post office, self-service kiosk or approved postal provider. o	Return your parcel at your own cost through your preferred carrier. The cost of shipping will be dictated by the carrier. All our clothing, footwear and homeware range in the UK is available to order on this website (exceptions include items where we don’t have trademark rights in Canada). Products in Beauty, Food, Wine, Furniture and selected homeware are available on our UK website for UK customers only. To shop on our site, choose from a selection of products: Women’s, Lingerie, Men’s, Kidswear or Homeware, and then the product type (e.g. : tops, pants, dresses etc). You can also change the currency you wish to shop in (GBP, CAD, USD, EUR etc) at the top right corner of the website. If you’d like to change your delivery address, please cancel your order as soon as possible and place a new one using your preferred address. You can cancel your order by clicking ‘Cancel Order’ on the order page in ‘My Account’. Please note that if this option has disappeared, we’ve already started to prepare your order for shipment and we can no longer make any amendments. In this instance we will still attempt delivery of your order but advise you to refuse the delivery which will generate a return. A refund will be processed upon return. We offer Tracked Express delivery within 3-5 business days on all orders, FREE for orders above $50. For orders below $50, a charge of USD $5 is applied for express delivery. No, the amount paid by you is fully inclusive of delivery to the specified delivery address and all duties, taxes and customs clearance fees. We send orders to USA as Delivered Duty Paid (DDP). However, you will be responsible for assuring that any products you order comply with state and federal government import regulations.